Most unplanned fires have a drastic effect on a pasture. Fire changes the plant composition and reduces growth and carrying capacity in the following season. The effects on pasture will vary with intensity of the fire, the pasture species, fertility of the soil, timing of the autumn break, and follow-up rains. We provide this information to support managers and others dealing with the effects of fire on a farm. The intensity, or how hot the fire is for how long, has a major effect on recovery of pasture. cool–moderate burns: most dead plant material is burnt with some seed and subterranean clover surviving. There will usually be a small residue of unburnt pasture or stubble. Cool–moderate burns occur where there is little dry grass to fuel the fire. hot burns: all dead plant material and many seeds are burnt. The topsoil usually appears charred and bare. Hot burns occur where there is a lot of dry biomass from crop stubble or lightly grazed pasture. very hot burns: the soil is virtually sterilised. All plant material and seed is destroyed and the fire burns into the top organic matter layer of the soil. Very hot burns occur under hay bales, windrows, on sheep camps, on soils with a thick root mat or where an intense fire emerges from bush areas onto pasture land. CSIRO researchers have noted that temperatures at the soil surface have reached 600°C in a very hot burn, about 100–250°C in a hot burn, and 50–150°C in a cool–moderate burn. The soil 15 millimetres below the surface is usually not heated by more than 10°C, and returns to its original temperature within 5 minutes. Plants that bury their seed or that have growing points below the surface have better survival after fire. Most annual grasses produce very little dormant seed. Usually 80–90% of the seed in one season will germinate in the following autumn. This means that fire which destroys annual grass seed will cause a drastic reduction in the annual grass component in the pasture. All the seed of the major volunteer grass species in south-west Western Australian pastures – such as barley grass, brome grass and silver grass – remain on or very close to the soil surface. This makes the seed vulnerable to being destroyed or sterilised as the fire passes. Subterranean clover buries its seed, substantially reducing the damage to seed caused by fire. Unlike annual grasses, subterranean clover also has large reserves of dormant seed in the soil. Survival and growth of subterranean clover and the annual grasses after a fire is highly dependent on rains after the break of season. Soil dries out faster where fire has removed surface litter. After a reasonable germination, many plants may be stunted or die following short dry spells. 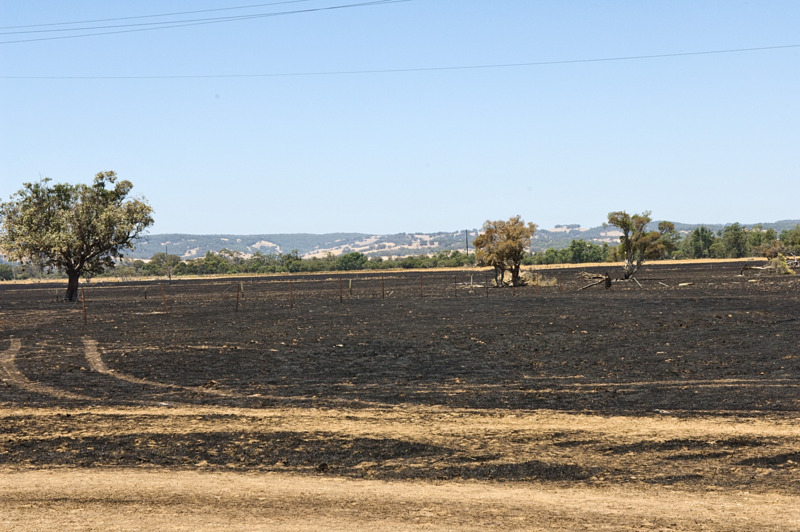 Recently resown perennial grass pastures can be seriously damaged by fire. The young perennial plants without well-established root systems and reserves are more vulnerable to fire damage, especially if the pasture was sown with a cover crop that fuels the fire. Almost all well-established perennial grasses survive a cool–moderate burn well. The ability to survive a hot burn varies between species: grasses with growing points below the soil surface survive best. Established lucerne survives even a very hot burn because of the large underground root reserves and growing points. Newly sown lucerne (less than 6 months old) can be killed by a moderate burn, particularly if there are a lot of weeds mixed through the stand to fuel the fire. The seed of annual weeds can be destroyed by fire in the same way as annual pasture plant seed. The massive amount of seedset by weeds, such as capeweed, often means that some still survive in the pasture in reduced densities. Also, burnt pastures are more susceptible to weed invasion. Nutrients present in standing plant material are returned to the soil in the ash. In the long term, a pasture does not gain any additional nutrients as a result of a fire. Fire generally reduces the amount of nitrogen available to the recovering pasture because organic matter near the soil surface is burnt, releasing nitrogen to the atmosphere. As a result, some burnt pastures show symptoms of nitrogen deficiency (pale to yellow leaves) during the following winter. Pastures with a good fertiliser history recover much faster and to a greater degree than those with a poor history. After a cool–moderate burn on pastures on low to moderately fertile soil, we recommend soil testing and adding nutrients based on the results. Fire reduces standing feed and regrowth, which reduces the carrying capacity of a pasture in the year after a fire. Pasture production after a fire is reduced more by low pasture density than by changes in the proportion of pasture species. The aim is to speed up the return of the pasture to its original density and productivity. For a cool–moderate burn, the pasture should recover to its original density during the following year, given adequate moisture and the absence of soil nutrient deficiencies. For a hot burn, manage the recovering pasture to maximise flowering and seedset for subsequent years. For a very hot burn, almost all plant material will be dead so the area should be cropped or resown to pasture following the fire. Sow new pasture seed: if weeds are dense, chemical weed control may be necessary before sowing the seed. Heavy harrow the paddock: heavy harrowing can unearth buried seed and improve germination, especially of subterranean clover. Wind erosion risk will be increased with this option, and this requires special management. Defer grazing: leaving livestock off the burnt pastures for 6 or more weeks after the autumn break improves the vigour and the growth of surviving plants. Add fertiliser: where there is an adequate density of regenerating plants, or pasture seed has been sown, adding fertiliser may speed early growth and recovery of the pasture. Use soil test results to decide on fertiliser rates. Control broadleaf weeds: where broadleaf weeds could dominate the recovering pasture, control them with selective herbicides or spray-grazing. Avoid cutting for hay or heavy grazing pressure during flowering and seedset. Aim to increase seedset and seed reserves for the following season.